Once in a while, I get to work with a brand I really love, not only for their products but also for their ethic! Professor Scrubbington ticks, hands down, all the boxes for me as a brand. Their luscious products are designed with the children who use them in mind (and make them smell divine, too!). Their professionalism is exemplary. Their prices are more than reasonable. And their branding is so much fun, it makes children want to scrub up, for real! But on top of everything, they do things that make my heart beat. They are mindful not only of the environment and their little customers’ skin. They have also been aware of the humanitarian crisis taking place in Europe this year and they have been donating discreetly yet generously, “to preserve the dignity of the young people of Syria”, as they put it so beautifully on their Instagram page. So, what are Professor Scrubbington’s magical concoctions? The full emporium kit is comprised of five items (each priced at £5), which can also be bought separately on the website: our absolute favourite, Scrubbington’s magically foaming hand and face wash; the magically foaming hair and body wash; the hair conditioner(by which I swear lately, as Emma generously gifted it to me); the magically foaming shampoo, which makes hair-washing so much fun!) and Scrubbington’s magically fragrant deodorant. We have put them all to the test here and we can honestly testify that they are easy to use, smell beautifully and leave one feeling squeaky clean and giddy with freshness! The lovely Professor Scrubbington is very eager to get my young readership on the cleanliness boat and has generously offered a suitcase gift box full of goodies(worth £20) to one lucky reader! For full details and ways to enter the giveaway, please follow this Gleam link. The link can be found on our Facebook page too. We were also offered a unique code to share with our readers, BM20, which will save you a hefty 20% any purchase on the website! So go ahead, do indulge your little ones, they are most certainly in for a treat they will be grateful to you for! Winner Announcement(04/11/2015): The Gleam app chose Wendy Montgomery as our giveaway winner. Congratulations, Wendy, we have dropped you an email with further details! It would be for my daughter if I won. Haa haa – loving that photo!!!! Brilliant photo! 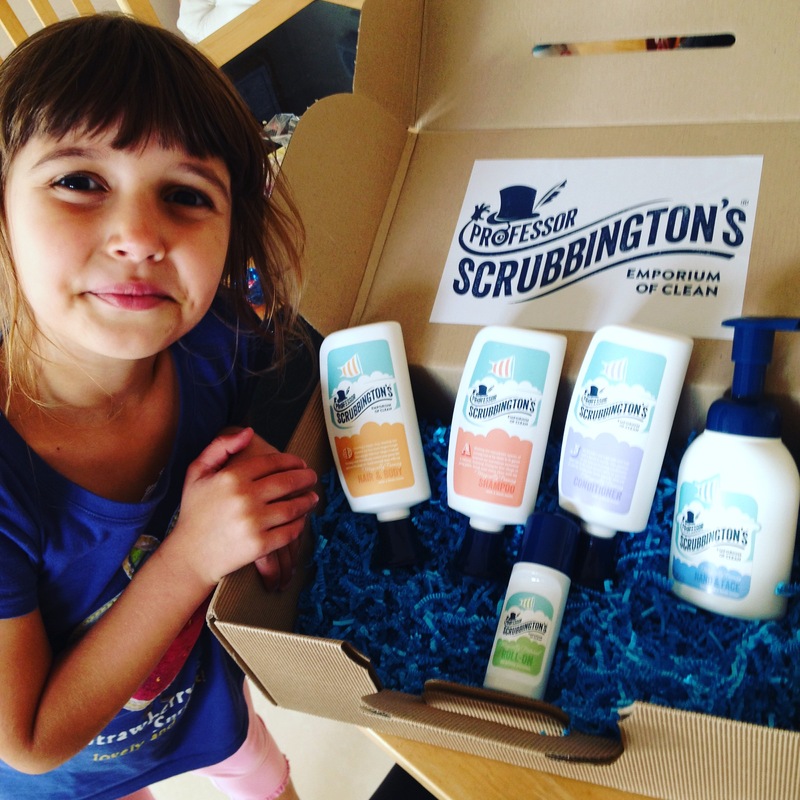 And what a great name for the product, I hadn’t heard of Prof Scrubbingtons before. I have an 11 year old that is starting to whiff, these would be just the ticket.. It would be for my son. Looks fantastic- my two children would really enjoy these! My nephew would be the recipient! He loves bath-time as it is and I think this set might just make it even better! We use Professor Scrubbington products but I had no idea of their generous background; how wonderful! Looks like a fab competition too, I will have to enter for my two littlies. We tested it out a while back and it has been a big hit for both of us. I can leave my son to wash himself and be safe in the knowledge that he can work the bottles and get the soap and shampoo out. I’d love to win him another set. I think my kids would really enjoy this. My kids would really love these! I would share it between the kids!!! I’m so impressed they’ve been donating towards the humanitarian crisis. Makes me like this brand even more. Oh how fabulous! I’ve heard great things about Professor Scrubbington’s so it’s nice to hear this. We were given some soap at an event recently and it’s lush! Next PostAn Extraordinary Saturday Out with McDonald’s!